At this Saturday’s Bellator 165 show, lightweight champion Michael Chandler puts his belt on the line against former UFC and WEC champion Benson Henderson. Chandler has been ranked as high as the #3 lightweight, but Henderson would still be one of the biggest wins on his resume. Chandler first entered the quarterly generated historical rankings in July 2010 as the #352 welterweight. After making his Bellator debut later that year, he jumped up to #281 welterweight. In 2011, Chandler dropped down a division and entered the season-four lightweight tournament. In the finals, he defeated Patricky Freire. His ranking moved all the way up to #25 lightweight. Later that year, he upset Eddie Alvarez and took the promotion’s lightweight title and began 2012 at the #5 lightweight. 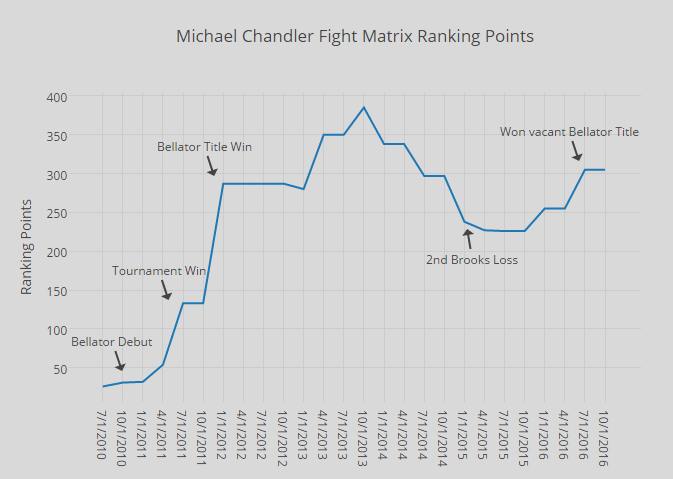 After three-consecutive losses, including a pair to Will Brooks, Chandler found himself ranked as low as #15. It was the first time he was ranked outside the top ten since 2011. He has fought his way back to the Bellator lightweight title, but he is still outside the top ten. In the most recent Fight Matrix rankings release he is #12. The good news for him is that a win over Henderson would likely propel him back into the top ten.